Effess are a band from Italy that plays a very cold and old school form of black metal and this is a review of a review of their self released 2017 ep "Chiatro". A very fast, raw and old school black metal style starts off the ep along with a great amount of tremolo picking and blast beats before adding in grim screams and melodic riffing and the music is very heavily rooted in the 90's second wave style and you can also hear all of the musical instruments that are present on the recording. Throughout the recording you can hear a great mixture of slow, mid paced and fast parts while ritualistic spoken word parts are also used briefly an d when guitar leads are utilized they are done in a very melodic fashion and they also do there own cover of Moonspell's Alma Matter while changing the lyrics to Italian while also keeping the clean vocals and also adding in a brief use of folk instruments and acoustic guitars are used briefly on the closing track. Effess plays a style of black metal that is very raw in the 90's tradition, the production sounds very dark, raw and old school while the lyrics are written in Italian and cover emptiness and ruins in everyday life, the void of the human condition, the wrongdoings of the church and the local rituals and traditions of Italian Paganism. 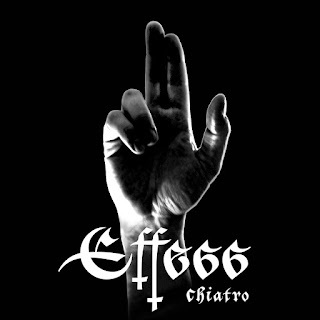 In my opinion Effess are a very great sounding raw and old school style black metal band and if you are a fan of this musical genre, you should check out this ep. RECOMMENDED TRACKS INCLUDE "Tutto Quanda" and "Chiatro". 8 out of 10.